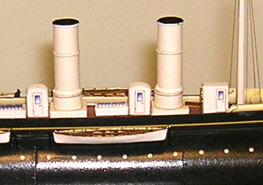 The Ross Winans was the fourth and largest of the "cigar boats" built by the Winans family, successful railroad engineers from Baltimore, Maryland. The brothers William and Thomas Winans with their father Ross had made their fortune building the Russian railroad system in the early 1850’s. Around that time they conceived the notion that the most advantageous shape for an ocean-traveling ship would be a spindle. The waves would wash easily over the decks, reducing rolling; the pointed hull would cut through the water with minimal resistance, increasing speed and reducing fuel consumption. 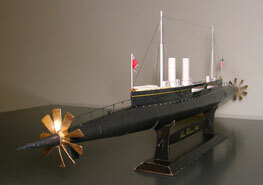 Based on these assumptions Messrs. Winans built three experimental craft between 1858 and 1864. None of them performed to their satisfaction. However, this did not to deter them. Their next attempt was planned as a luxury yacht. The craft was laid down in 1864 at Hepworth’s Yard on the Isle of Dogs in London and was launched in 1866. The hull was 256 feet long, but only 16 feet in diameter. A superstructure 130 feet long and 10 feet wide perched on top. 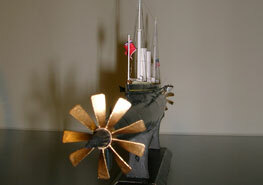 She was driven by two nine-bladed propellers, 22 feet in diameter and revolving at about 50 rpm. 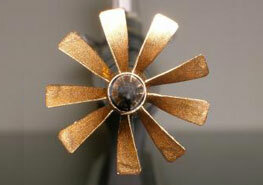 The Ross Winans combined a number of ingenious mechanical inventions, many patented by the Winans family. She was the first vessel to use high-pressure steam engines, forced-air ventilation, self-centering drive shafts, and derricks for lowering her boats. Many of these inventions were subsequently used in other vessels. A unique feature was a shifting ballast of 12 tons of lead in the shape of a huge pendulum. It was moved by a small steam engine and allowed the ship to automatically adjust for the list created by the torque of the main engines. The original cost of the Ross Winans was about 60,000 pound sterling, or about $6.5 million in today’s money. Despite the evident engineering genius that went into her, the Ross Winans, like her predecessors, ultimately proved a failure. Apparently her deck became untenable even in fine weather, because the semi-submerged front propeller inundated it with spray. As the ship had no cut-water, the waves washed freely against, and probably often over, the superstructure when the ship was under way. The saloon and state rooms were luxuriously appointed, but they were cramped and uncomfortable, as must have been the crew quarters. The Ross Winans made several trial trips in the Solent, and possibly one or two small coastal voyages. However, she was never registered with Lloyd’s. Apparently the Ross Winans did not leave her moorings for the next 30 years. She continued to be well maintained and became an attraction for sightseers visiting Southampton. After the owners died, she was sold to a Bristol ship-breaker for 210 pounds.